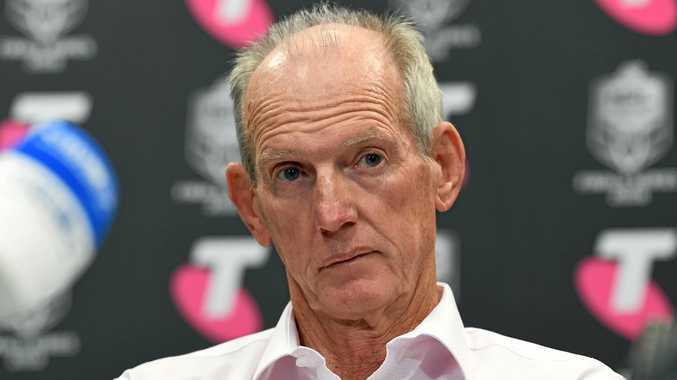 WAYNE Bennett has been named as South Sydney coach for 2020 and 2021, the Rabbitohs announced on Thursday afternoon.Rabbitohs general manager of football Shane Richardson said the signing of Wayne Bennett was a fillip for the club. "Wayne is one of the best, if the not the best, rugby league coaches of all time and we are excited to see what he can bring to our club," Mr Richardson said. "His football record is second to none and his reputation as a leader is also of the highest order. "Here he will have the opportunity to work with some of the best senior and up-and-coming talent in the game, which from our discussions over the past few weeks I know he is excited about. "He will also have the opportunity to work as a head coach with a strong coaching, football and administration staff around him that are all pushing in the one direction, the Rabbitoh way. "Anthony (Seibold) has done a great job at our club over the past two years, however, his hesitance to extend his contract with us, an offer which has been on the table since June, led the club to explore other options. "We're looking forward to Wayne becoming a Rabbitoh in 12 months' time and we wish him the best of luck with the England team in their current Test series with the Kiwis. "Now we can look forward to Season 2019 with the aim of improving our performance on the 2018 season." The Brisbane coach and Seibold could complete a straight swap for the 2020 season. Seibold had informed Souths management his preferred option was to pursue negotiations with the Broncos. Bennett, 68, is unwanted by the Broncos for 2020 and has consistently maintained his belief he can coach in the NRL for at least another two years. Broncos chief executive Paul White has overseen an interview process that has quizzed four candidates - Seibold, former Souths coach Michael Maguire, Kevin Walters and current Brisbane assistant Jason Demetriou. But it is understood Seibold has won the battle. The development will come as a shattering blow for Walters, the Queensland Origin coach and Brisbane premiership legend who had his heart set on coaching his beloved Broncos. Seibold has a history with the Broncos, having played lower-grade football for the club. He enjoyed instant success in his NRL coaching debut with the Rabbitohs this year, coaching Souths to the top four and a grand-final qualifier. Bennett has a great respect for the history of the Rabbitohs and he almost joined the club in 2012. At the time, Souths chief executive Shane Richardson flew to Brisbane to begin negotiations, and met with Bennett at his home, armed with a multi-year deal worth $900,000 a season. The talks stretched out for most of the day. Such was the promising nature of the dialogue, Richardson headed for Brisbane airport confident his sales pitch had secured Souths' highest-profile coach since Jack Gibson called the shots in 1978. But the Rabbitohs' pursuit unravelled when the Knights entered the bidding war, with Nathan Tinkler's fortune blowing Souths out of the race with a four-year deal.